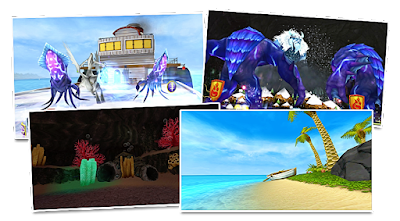 Introducing the newest Wizard101 game card available in stores now: the Fantastic Voyage Gauntlet! You'll find this all new game card at Walmart stores across the United States, for $39. The Fantastic Voyage Expedition will take you a quest to find the very rare Micro Fish. In order to succeed, you will have to fight four different battles. After completing the gauntlet, you will be awarded the "Fantastic Voyager" badge and a free Fishing Luck elixir. You will then be able to fish on the beach, where you can find an exclusive fish! 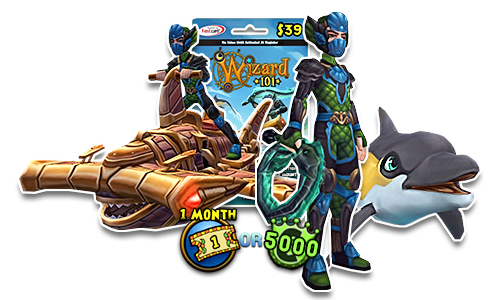 The Shark Skirunner Mount is a clockwork mount specifically engineered to give your Wizard a 50% speed boost, making it one of the fastest mounts in the Spiral! After much demand, KingsIsle introduces the very first dolphin-like pet in the game, with the Peppy Porpoise! This adorable cetacean comes with a Lifespear card at Baby, a starting pedigree of 69 and excellent stats for a first generation pet. The Abyssal Warrior's Suit goes up to Level 120 and gives remarkable overall stats to your Wizard. The Abyssal Eel Whip has an electrifying animation (pun intended) and will grant your Wizard 3% universal pierce, 70 critical rating, 12% universal damage, 1 power pip, 215 pip conversion rating and Maycast Wild Bolt and Healing Current at Level 120+. 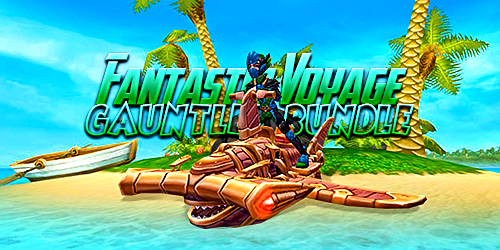 Trying to track down a Fantastic Voyage Gauntlet Bundle? Check out the list of stores where you can find it!